February 2019: Kim gave a departmental seminar in the Department of Chemistry at Bath University. February 2019: Andrew has joined the group from the University of Adelaide. He is funded for a PDRA by the Leverhulme Trust. February 2019: Francesco’s paper on “The influence of nitrogen position on charge carrier mobility in enantiopure azahelicene crystals” is now out in PCCP. January 2019: Kim gave a departmental seminar in the Department of Chemistry at Durham University and at the Centre for Computational Chemistry in Bristol. January 2019: Kim gave an invited talk on “Predicting the supramolecular structure and properties of chiral helicenes” at the Chiral Functional Materials symposium at Imperial College London, organised by Profs. Matt Fuchter and David Amabilino. January 2019: Tim, previously at Cardiff University, has joined the group as a PDRA. December 2018: Julia and James attended the RSC MASC (Macrocyclic and Supramolecular Chemistry) meeting at the University of Lancaster. December 2018: Lukas’ paper on “Machine Learning for Organic Cage Property Prediction” is now out in Chem. Mater.. See the publications tab for links to the data, code and online app for the predictions. December 2018: We had our group Christmas celebration, including food, secret santa and mini golf - congratulations to Ed for winning. November 2018: Irene has joined the group to carry out a PhD in the modelling of amorphous materials, and Filip has joined the group as a PDRA funded by the Leverhulme Trust to study large organic cages. October 2018: We have a PDRA position available to work on “Evolutionary screening of coordination cages”, funded by the Royal Society. See the “Opportunities” tab for more information (closing date 27th November 2018). October 2018: We’re welcoming Steven to the group as a new PhD student and Felix is joining to carry out his MSci research project in the group. September 2018: Kim is now an Academic Fellow of the Data Science Institute at Imperial. September 2018: Our paper on the supramolecular toolkit (stk), developed by Lukas, is now out in J. Comp. Chem., having previously been on ChemRxiv. You can find the software on github: here. September 2018: Our paper on the development and use of an evolutionary algorithm for the discovery of porous organic cages is now out in Chemical Science, having previously been on ChemRxiv. September 2018: Marcin’s article on the pywindow software he developed during his PhD is now out in J. Chem. Inf. Model., having previously been on ChemRxiv. You can also find his software: here. September 2018: Kim gave an invited talk at the Leverhulme Research Centre for Functional Materials Design Inaugural Symposium in Liverpool and at the Materials and Molecular Modelling Hub 2018 conference at University College London. September 2018: Our Nanoscale paper on cage topologies was listed in the Royal Society of Chemistry's themed collection of articles showcasing the work of 100 influential women of chemistry. July 2018: The group have moved to Imperial's new White City Campus and the new building for the Department of Chemistry - the Molecular Sciences Research Hub. July 2018: Marcin and James attended the early career researcher meeting of the RSC Macrocyclic and Supramolecular Chemistry Group in Manchester, with Marcin giving a talk about his PhD research. July 2018: Kim gave an invited talk at the TYC's 5th Energy Workshop: from Atoms to Applications at UCL. July 2018: Kim visited the Universidad de Valencia, giving a departmental seminar. July 2018: Kim was interviewed by Keith Butler for his "Materials Hipster" series, you can read the interview here. 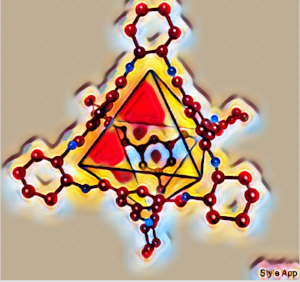 July 2018: Kim was awarded a Leverhulme Trust Research Project Grant on "Computational Design of Large Organic Polyhedra", we'll be hiring a new PDRA from this grant soon. July 2018: Our new paper with the Cooper group is now out in Nature Communications. We show how computational screening can be fused with robotic synthesis to assist in the discovery of 33 new porous organic cages. Congratulations to Valentina who ran the calculations for the computational assembly and screening of the molecules during her PhD, and to Marcin, whose software, pyWindow, was used in the analysis of the molecule's voids and molecular dimensions. June 2018: James Pegg joined the group as a PDRA on the EPSRC grant "Rational design of functional macromolecular materials". June 2018: Kim attended the CECAM meeting on "Computer Simulation of Chemical Technologies involving Confined Liquids" in Dublin, presenting an invited talk. June 2018: Marcin and Kim went to the CECAM meeting on "Multi-scale modelling of flexible and disordered porous materials" in Paris, where Kim gave an invited talk and Marcin presented a poster. June 2018: Congratulations to Marcin who passed his PhD viva! His thesis is entitled "Property Screening of Porous Organic Molecules". June 2018: Alejandro Santana Bonilla joins the group as a PDRA on Kim's ERC Starting Grant, "Computational Molecular Material Discovery". May 2018: Congratulations to Valentina who passed her PhD viva! Her thesis is entitled "Computational modelling and topological design of porous organic cages". April 2018: The group's first ChemRxiv preprint is online. "stk: A Python Toolkit for supramolecular assembly" presents software developed by Lukas during his PhD so far, and is a tool for the automated assembly, molecular optimization and property calculation of supramolecular materials. The software can be found on github. April 2018: Qi Yuan joins the group as a PDRA on Kim's ERC Starting Grant, "Computational Molecular Material Discovery". April 2018: Kim gave an invited talk at the UK-MOF Symposium at the University of Southampton. January 2018: Our paper titled "A computational exploration of the crystal energy and charge carrier mobility landscapes of the chiral helicene molecule" is now out in Nanoscale. We explore the relationship between structure, energy and charge-carrier mobility in this organic molecule. October 2017: Julia has joined the group to study for her PhD in structure prediction of materials for organic electronics. September 2017: Kim has been awarded an ERC Starting Grant to work on "Computational Molecular Materials Discovery", which provides €1.5 million over the next 5 years. Post-doctoral positions associated with the grant will be advertised soon, but informal enquiries are welcome in the meantime. August 2017: Marcin and Enrico attended the Nanoporous Materials Gordon's Research Conference in New Hampshire, US, where they both presented a poster. They also both attended the Gordon's Research Seminar beforehand, where Marcin gave an oral presentation. By all accounts, they had a great time and many interesting discussions throughout the week. July 2017: Our paper with the Fuchter, Nelson and Campbell groups at Imperial, on the "Emergent properties of an organic semiconductor driven by its molecular chirality" is now out in ACS Nano. We contributed crystal structure prediction calculations, to help explain the experimentally observed behaviour. July 2017: Marcin gave a talk on "Computational screening of porous organic molecules for Xe/Kr separation and C60 encapsulation at MC13, the RSC's Materials Chemistry conference in Liverpool. Kim was on the organising committee for the meeting. June 2017: Marcin's paper on "Computational Screening of Porous Organic Molecules for Xenon/Krypton Separation" is now out in J. Phys. Chem. C.
May 2017: Valentina's paper on "Chirality as a tool for function in porous organic cages" with Tom Hasell is now out in Nanoscale. May 2017: Our review paper with Jack Evans, Christian Doonan and Graeme Day on the use of molecular simulations for the design and characterisation of porous molecular materials is now out in Chem. Soc. Rev..
April 2017: Kim's daughter Rosalind arrived at the end of April! Kim will be on maternity leave over the summer. April 2017: Valentina attended ICCOSS-XXIII in South Africa, giving a talk on her PhD project. She thanks the RSC Materials Chemistry Division and RSC South Africa for travel bursaries to make the trip possible! March 2017: Our paper in Nanoscale "Topological landscapes in porous organic cages" is out - see a summary of the work and our proposed nomenclature for the topologies of porous organic cages on the "Cage Topologies" tab of this website. Congratulations Valentina, Marcin and Enrico! February 2017: Marcin won the runner's up prize for best final year student talk at the Thomas Young Centre Student's Day 2017. February 2017: James gave a talk at the TRNM (Towards Reality in Nanoscale Materials) Annual workshop held in Finnish Lapland, north of the Arctic Circle. January 2017: Kim gave a departmental seminar at the Atomistic Simulation Centre at Queen's University Belfast. December 2016: Valentina, Marcin and Enrico attended the RSC Macrocyclic and Supramolecular Chemistry meeting (MASC 2016) in Edinburgh, with Valentina and Marcin presenting posters. December 2016: Kim gave a talk at the launch of Phase 3 of the EPSRC Directed Assembly Grand Challenge network at the Royal Society, highlighting the contribution of the network to her independent research so far. December 2016: Kim is now a Fellow of the Higher Education Academy (FHEA). December 2016: Kim gave invited talks at the 9th International Meeting on Membrane Science and Technology Conference (IMSTEC) and the Fundamentals and Applications of Advanced Porous Materials satellite meeting in Adelaide, Australia. November 2016: Marcin presented a poster at the RSC Materials Chemistry Division poster symposium and Valentina gave a talk at the Young Modellers' Forum. November 2016: Paper out in Nature Chemistry on the "Reticular synthesis of porous molecular 1D nanotubes and 3D networks" with the Day group (Southampton) and Cooper group (Liverpool). This research was highlighted in a Nature Chemistry News & Views article, as well as featuring on the front cover of the journal. October 2016: Enrico, Marcin and Lukas attended the 5th RDKit UGM in Basel, Switzerland, where Marcin gave a lightning talk about the use of RDKit for organic cage research. October 2016: Valentina has a new paper out on "Periphery-functionalised porous organic cages" in Chem. Eur. J.
October 2016: Kim commented on a paper from the Snurr group on virtual screening of MOFs for Chemistry World. October 2016: Lukas joins the group as a PhD student. September 2016: Oxana finished her summer project in the group, sponsored by the Theory and Simulation of Materials CDT at Imperial. September 2016: James and Marcin went to the E-MRS Fall Meeting in Warsaw, Poland and both presented talks on their PhD work. September 2016: Most of the group attended the CCP5 Annual Meeting at Harper Adams University, with Valentina, Marcin and James giving talks and Ed presenting a poster. September 2016: Marcin attended CMD26 (Condensed Matter in Gronigen) and gave a talk on his PhD work in the nanoporous materials colloquia. August 2016: In an article in Chemistry World, Kim commented on a recent Science paper from the Lively group on carbon molecular sieves for xylene separations. July 2016: Kim gave an invited talk at the CCP9 (Electronic Structure) Young Researchers Event at the University of York. June 2016: Congratulations to James, winner of the group squash tournament! June 2016: Congratulations to Valentina for winning the RSC Talk Prize at the Southampton Supramolecular Chemistry Symposium, where Marcin, James and Ed also presented posters. Also congratulations to Jasper for graduating with a First for his MSci. June 2016: Our recent paper on polymer membranes in Nature Materials has been highlighted in a Nature Materials News & Views article on "Contorted separation" by Prof. Neil McKeown. June 2016: The group celebrated James' birthday with Mexican food. April 2016: Marcin won at group bowling night. May 2016: The TOC for Dan Holden's paper on understanding porosity in porous molecular materials was featured on TOCROFL! May 2016: Our paper in J. Phys. Chem. C with the Zwijnenburg group at UCL upon amine cages as explosive sensors is now out. May 2016: Our paper in Nature Materials, with the Livingston group in Chemical Engineering is now out. This includes our work on polymer structure prediction and how monomer structure influences membrane performance. Read about the work on the Imperial website: here, highlighted by the Materials Research Society: here and hear Andrew Livingston talking about the work: here. April 2016: Kim gave a departmental seminar at the Department of Chemistry, University of Edinburgh. March 2016: Kim co-organised the Recent Appointees in Materials Modelling meeting (RAMM2016) at Queen Mary's, University of London, together with Dr. Rachel Crespo-Otero and Dr. Benjamin Morgan. March 2016: Kim gave a talk at the UK MOF Symposium at the University of Bath, organised by the British Zeolite Association. Valentina won the poster prize! December 2015: The group celebrated Christmas with ice skating at the Natural History Museum, followed by dinner. December 2015: Kim gave a departmental seminar at the Department of Chemistry, UCL. November 2015: Kim gave a departmental seminar at the Department of Chemistry, Cardiff University. October 2015: Ed has joined the group to start an EPSRC Industrial CASE PhD studentship on molecular separations and Jasper has joined the group for a MSci project investigating hole transport materials. September 2015: The group successfully escaped the room at HintHunt! September 2015: Valentina's paper on predicting solvent effects in porous organic cages is now out in Chem. Comm. September 2015: Our paper in J. Phys. Chem. C on modelling the tunable porosity of a tercrystal of porous organic cages is now out. This paper resulted from undergraduate student Rex's research in the group. August 2015: Kim was a discussion leader at the Gordon's Research Conference (GRC) on Nanoporous Materials in NH, US. July 2015: Kim gave a talk at the International Conference on the Control of the Organic Solid State (ICCOSS) in Niigata, Japan. June 2015: Kim gave an invited talk at the Workshop on Flexibility and Disorder in Metal-Organic Frameworks in Paris, France. April 2015: Kim gave two talks at the Materials Research Society Spring meeting in San Francisco, US. She then gave a departmental seminar at the Department of Chemistry, UC Merced, California.